Freedom struggle easy to moderate level questions. Freedom Struggle: total six questions. Among them, except the MCQ on Kesab Chandra Sen, rest of the stuff pretty easy and could be solved with Pratik Nayak’s Lecture series, NCERT, Lucent GK, Spectrum and other standard sources. 1 MCQ on which movement led to split among Moderates vs. Extermist. (Ans was Swadeshi) It seems, UPSC’s gramophone has stuck on this track. this time two MCQ- 1) why split 2) Swadeshi & Boycott started from? From economic history of British raj, they’ve been asking moderate to tough level MCQs especially in CAPF and CDS. Thankfully nothing from this side. Culture and Ancient/Medieval India: hardly 3 MCQs in 2015. and all of them quite easy and straight forward. Culture: resurgence of culture- direct jump from 3 MCQ to 11 MCQ. 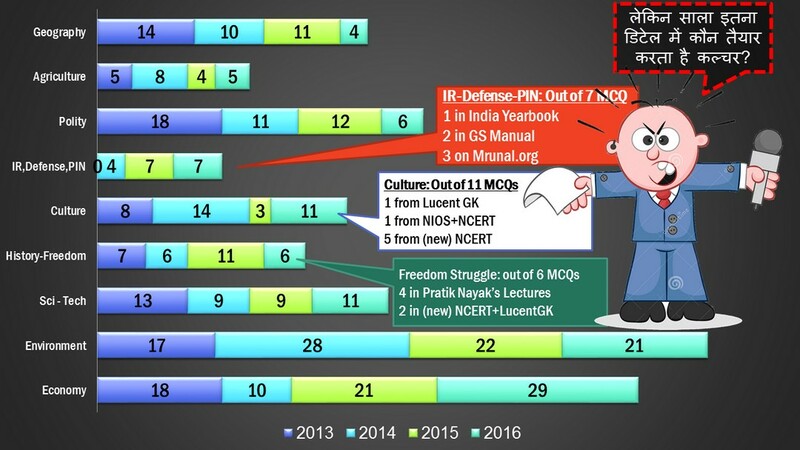 7 out 11 MCQS directly solved from (New) NCERT, Lucent GK and NIOS-Culture. But in real exam very difficult to solve, because of trivial-factual nature of questions. UPSC’s Prem for Buddism, Jainism had declined. Just one MCQ on Buddhism. 1 MCQ on Bodhisatva, 1 on Ajanta. Tough question about rock cut monuments. 4. With reference to the art and archaeo logical history of India, which one among the following was made earliest? 40. What is/are common to the two historical places known as Ajanta and Mahabalipuram? 1. Both were built in the same period. 2. Both belong to the same religious denomination. 3. Both have rock-cut monuments. What is the meaning of Panchayatan? Who were Mahattara’ and ‘Pattakila? This time, examiner’s “PREM” for Medieval dictionary, is border lining that of a lunatic. Terms (1) Eripatti (2) Taniyurs (3) Ghatikas vs. their meaning? Religious outlook of Sittar and Lingayats? In 2013, 14, they used to ask tough MCQs from Vedanta and philosophical things. Thankfully nothing from that side. If I spend more time observing the papers, I could come up with more similarities and continuities. But let’s not waste the remainder of our jawaani on this single matter…The conclusion is- 2016’s History-Culture is more akin to 2014’s prelims rather than 2015. Good number of culture/medieval MCQs were from non-traditional topics within (New) NCERTs. You should prepare them, with changed glasses. Out of 17 MCQs on History-Culture in Prelims-2016, only 5 MCQs are ‘out of book’. Remainder things given in the (new) NCERT, NIOS, Lucent, Spectrum, Pratik Nayak’s Lecture series. Hence they should form the ‘core’ area of preparation. But it doesn’t mean 17-5=12 MCQs can be correctly ticked in actual exam. Because in culture-medieval portion very trivial factual information’s asked e.g. Malvikanimtriam is love story of Pushyamitra Sunga’s son. This is given in Lucent GK but who has time to memorize so many details. So beyond a point, marginal utility turns negative. You could spent that much time in Economy, environment – and tick more. Class 12 NCERT History, Page 130: Jyotiba Phule had setup this organization to begin anti-caste movement in Maharashtra. Tamilandu State board textbook Class-11 also covers. 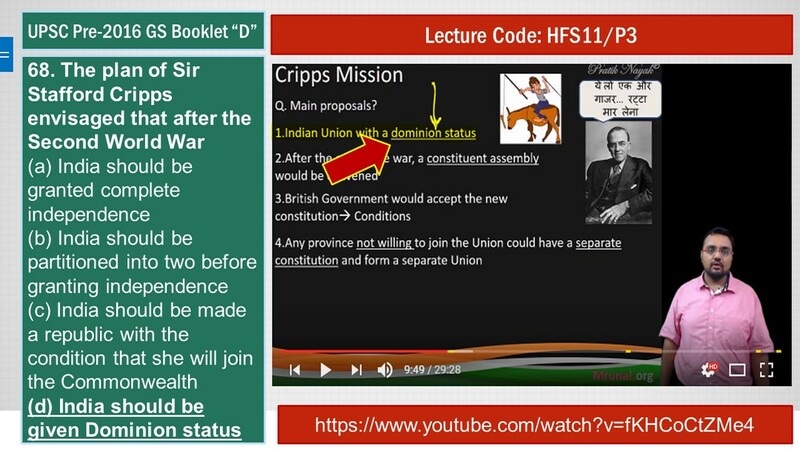 Pratik Nayak’s Lecture HFS8/P3: They’re related to Constitutional reforms. Calcutta Unitarian Committee was formed by Raja Rammohan Roy, Dwarkanath Tagore and William Adam, hence irrelevant to the question. Hence Option A and D are eliminated. 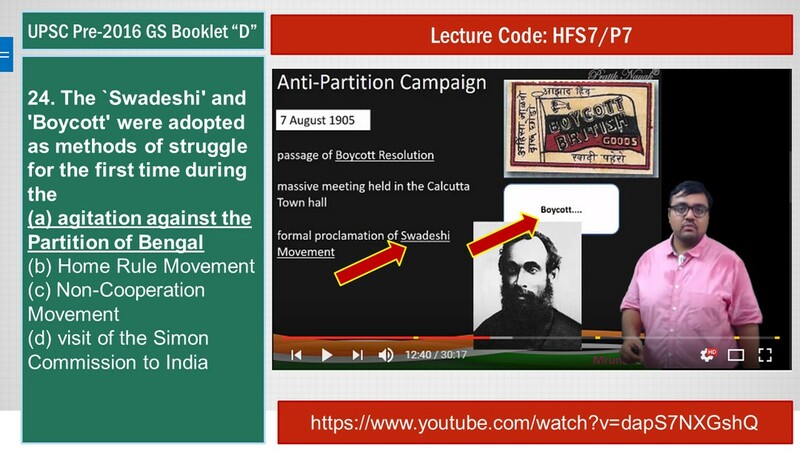 From Plassey to Partition (2nd ed. ), Shekhar Bandyopadhyay, Page 153, 1st Paragraph: 1881, Keshab Chandra Sen established Naba Bidhan ( New Dispensation) meaning new universalist religion after having differences within Brahmo Samaj. Hence 2nd statement is right. Hence we’re left with Answer B) only 2 and 3. Just to cross check, yes third statement is right. Sen formed Indian Reform Association (1870) to persuaded the British government to enact the Native Marriage Act of 1872( Civil marriage act) legalizing Brahmo marriages and fixing minimum marriageable act for boys and girls. Says Lucent GK 4th Ed, Page 98. 67. 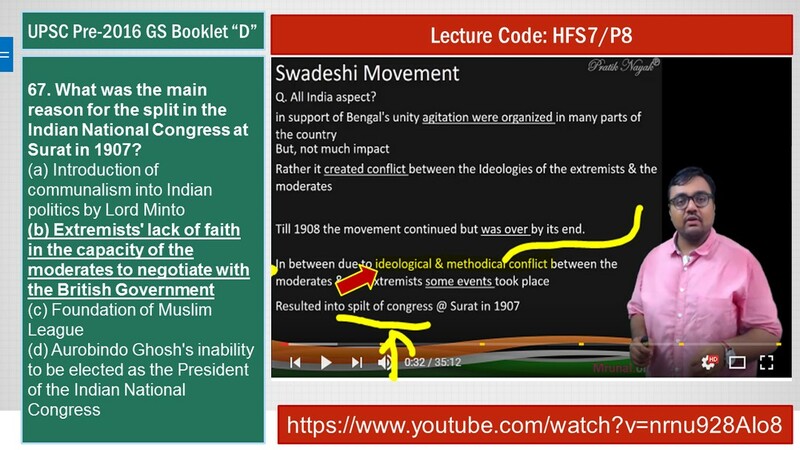 What was the main reason for the split in the Indian National Congress at Surat in 1907? Introduction of communalism into Indian politics by Lord Minto: it was introduced in 1909, Morley-Minto Reforms, it took place “AFTER” The split, hence irrelevant. Foundation of Muslim League: Established in 1907, but not related to split among congress. Irrelevant. Aurobindo Ghosh’s inability to be elected as the President of the Indian National Congress: In 1907, the extremists wanted either Tilak or Lajpat Rai to be president, so when Rasbehari Ghose was announced as president, the extremist resorted to violence. Hence Surat Split. “D” is also wrong. India should be made a republic with the condition that she will join the Commonwealth: This decision was made after independence by the constituent assembly. The Banjaras were the most important trader- nomads. Their caravan was called tanda. Sultan Alauddin Khalji used the Banjaras to transport grain to the city markets. Emperor Jahangir wrote in his memoirs that the Banjaras carried grain on their bullocks from different areas and sold it in towns. They transported food grain for the Mughal army during military campaigns. With a large army there could be 100,000 bullocks carrying grain. 14. Who of the following had first deciphered the edicts of Emperor Ashoka? referred to the king as Asoka, one of the most famous rulers known from Buddhist texts. Page 103: under the sub-heading Mahayan Buddism, they’ve written : “The concept of the Bodhisatta also developed. Bodhisattas were perceived as deeply compassionate beings who accumulated merit through their efforts but used this not to attain nibbana and thereby abandon the world, but to help others. The worship of images of the Buddha and Bodhisattas became an important part of this tradition. This new way of thinking was called Mahayana – literally, the “great vehicle”. Hence first statement is wrong. This eliminates A and D; while 2nd and 3rd statements are correct and by elimination of #1, there is only one such option left ie. B) 2 and 3 only. Can be answered if you’ve read NCERTs with a Persian Dictionary (!) Now, UPSC trolling people through NCERTS. (New) NCERT Class 7 Page 6 and 7 discusses invention of Persian wheel in irrigation. Upon searching google book– we find this device was known as “Araghatta”. साला इतना डिटेल में कोन तेयार करता है? 64. With reference to the cultural history of India, the memorizing of chronicles, dynastic histories and Epictales was the profession of who of the following? Hence D is the right choice. (New) NCERT Class 11 Page 28: Bodhgaya is in Bihar. Hence A and D eliminated. NIOS Culture PDF, Page 194: Chandella Kings built Khajuraho in Bundelkhand region of Madhya Pradesh. Hence #2 is right. But it doesn’t help in elimination, we are still left with B or C.
It’s common knowledge that Nashik is located in Maharashtra. Now observe the map given on (new) NCERT class 9 ch.2- Nashik ought to be in somewhere in or around Deccan plateau, rather than Malwa plateau. Hence #4 is wrong. By elimination, now we are left with only C) 2 and 5. 1. Siddhas (Sittars) of Tamil region were monotheistic and condemned idolatry. 2. Lingayats of Kannada region questioned the theory of rebirth and rejected the caste hierarchy. Page 147: The Lingayats challenged the idea of caste and the “pollution” attributed to certain groups by Brahmanas. They also questioned the theory of rebirth. Hence 2nd statement is right. Page 148: At the same time other religious leaders, who did not function within the orthodox Brahmanical framework, were gaining ground. These included the Naths, Jogis and Siddhas. Many of them came from artisanal groups, including weavers. From this, it can be inferred that statement 1 is also right. But just for the sake of crosschecking- yes Google Book also confirms (Ref#1). Land revenue varied according to nature of cultivated land. So, #1 is right. Another source- From the travelogue written by Persian envoy Abdur Razzaq in the court of Vijaynagar- and mentioned in RC Majmoodar’s Advanced History of India, gives similar hints. Anyways, UPSC official Answerkey will clear it. 85. Which one of the following books of ancient India has the love story of the son of the founder of Sunga dynasty? Lucent GK, Page 35: Sunga Dynasty was established by Pushyamitra Sunga…..He was succeeded by his son Agnimitra-the hero of Kalidasa’s drama “Malvikagnimitra” Hence answer has to be (B). Sanskrit play by Kalidas, tells the story of the love of Agnimitra, the Shunga Emperor at Vidisha, for the beautiful hand-maiden of his chief queen. Anyways, let’s also prepare the remaining options (through net surfing) – incase the question gets recycled in some other exam! Ratnavali: Drama between Queen Ratnavali and King Udayana. Indian History, Krishna Reddy Page B-58: Cholas created revenue units called “Taniyur” out of larger Brahmadeya. From NCERT Class 7 Page 26, we know that Brahmadeya means land gifted to Brahmanas. So, #2 may be right, may be wrong. But there is no option with 1, 2 and 3 correct. So, we can safely take #2 as wrong. Hence, Only 1 and 3 are correctly matched. Anyways stupid and tough question. Who has time to memorize Ancient-Medieval dictionary. The collective amount of time and energy wasted in searching this answer by UPSC aspirants on internet….utne mein toh atleast one MNREGA pond could have been dug up. They mostly asked ‘contemporary’ current type MCQ that were spread through months, rather than one specific event. Two current affairs they picked up from October 2015- INS Astradharini and India-Africa Summit. Some MCQs- are ‘contemporary’ current affairs – such as Rohingya, Madeshi, Belt-Road- they’re not specific to one day event, but rather spread through months. India is member of which groups? NPT not signed by whom? Mekong Ganga doesn’t include whom? UPSC had stopped asking PIN (Persons in News)since inception of CSAT system in 2011 Finally resumed- with a rather easy MCQ- A man who knew infinity -movie on Mathematician S.Ramanujan’s life. 1) Doctor without border, 2) GCC-members: these two MCQs are verbatim given in same page Macgrawhill’s GS Manual. Due to paucity of time, I’ve not checked others- but I’m sure such Intl. org. ready reference tables are available in Pearson, Spectrum and other GS manuals as well. You should atleast go through a 2nd hand copy of it. Even India yearbook should be carefully read, including the ‘current events diary’ given in the last pages. INS Astradharini answer was directly given in it. Apart from this, you’ve to cultivate habit to read theHindu / Indian express (Rajamohan) on regular basis. It may be possible to finish prelim-specific matter through jugaad-panti, But for mains-interview, the command over the diplomatic vocabulary, language, sentence formation and ideas, can’t come without reading the original editorials. IR-defense they’ve been asking since last two years continuously, so it’s not an unexpected pattern. But yes, some of them require factual memory e.g. 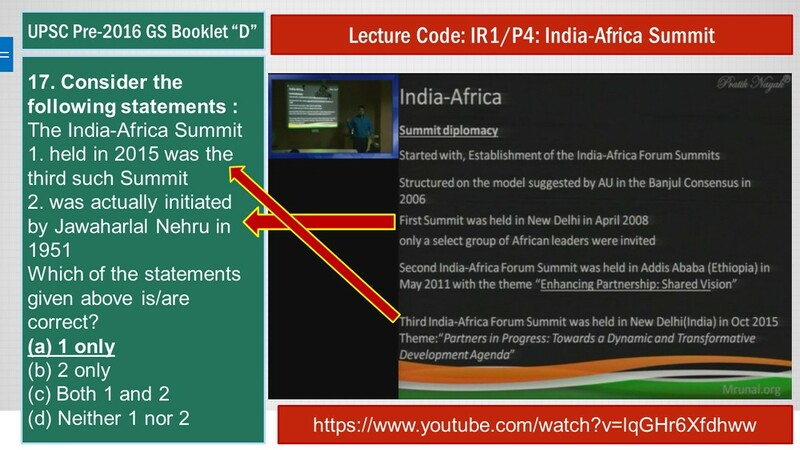 India-Africa summit in 2015 was 3rd summit or not? – so, it’s difficult to solve. To an extend, some may find IR-MCQ section to be “pro-senior player”, but given the nature of the factual details asked- some are solvable for all (e.g. 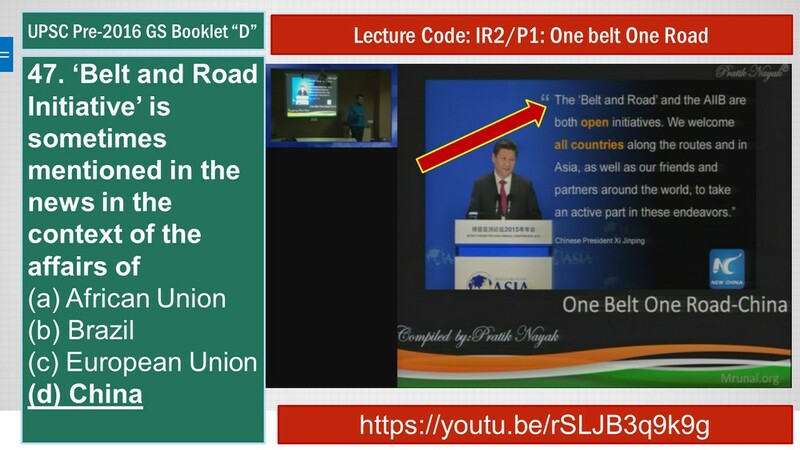 belt and road), and some are solvable by (almost) none of the players- irrespective of whether fresher / senior. 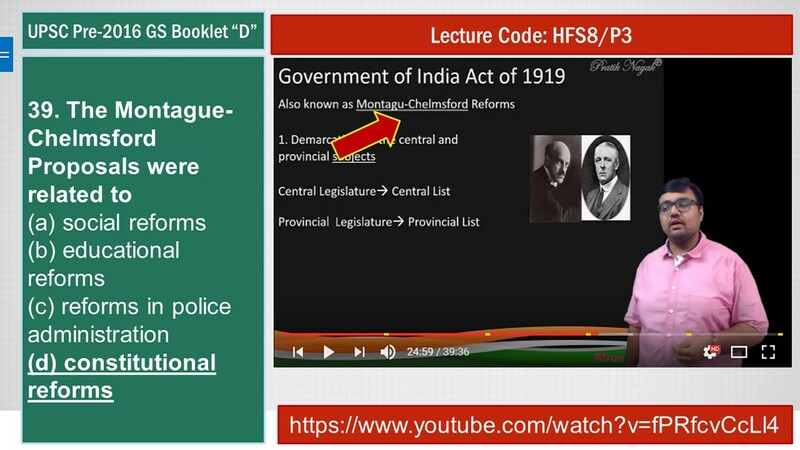 Prateek Nayak lecture (IR1/P5); Slides no- 24. 2nd statement is wrong: because First Summit was held in New Delhi in April 2008. Therefore, it can’t be Nehru’s brain-child. Even in elimination through gut-feeling there may be 50:50 between B and C- because of the Latin/French sounding name and mention of EU in “C” option. 45. Which of the following is not a member of `Gulf Cooperation Council’? Through gut-feeling, possible to tick correct answer, because Iran as such an odd-ball usually ostracized among Middle-eastern groups. Macgrawhill General Studies Manual 2015: Section General Knowledge Page 64. List of GCC countries is given. Iran is not there. Another source: covered in Mrunal’s 2013 summary of Economic Survey. Prateek Nayak lecture – IR2/P1: opening slide itself vertim gives this. Actually whole 36 min. lecture is dedicated to this topic only! #1: is wrong. Kurd pair should be either Turkey (for 2016, demand for separation nation) or Iraq (2015, their political movement in the after years of Saddam-fall). 1. It is an organization of European Union in working relation with NATO and WHO. 2. It monitors chemical industry to prevent new weapons from emerging. 3. It provides assistance and protection to States (Parties) against chemical weapons threats. Possible to solve through gut-feeling as well- because EU+NATO+WTO combo seems far-fetched for an organization. 21. Which one of the following is the best description of ‘INS Astradharini’, that was in the news recently? India Yearbook 2016 page 972: Last section Indigenously built Torpedo Launch and Recovery Vessel ‘INS Astradharini’ commissioned in October 2015. Answer- A. Mrunal’s April-2016 current affairs compilation ‘The Man who knew infinite’ is a biographical movie of Indian Mathematician Srinivas Ramanujan (played by Dev Patel) and his association with British mathematician GH Hardy. Ramanujan was a self-taught (autodidatic) Mathematician- born and died in Madras Presidency. Sir 84th Bit in AgniHotri and Krishna Reddy books they are not given like that Agni Hotri Medieval india topic Page No.147 and Krishna Reddy Medieval India Provincial dynasties how to answer such questions. And one more doubt I got sir in Vijayanagara empire the taxation is very high if they adopt the differentiation tax system basing on the kind of land how they realized such high taxes as the land revenue is the principle tax. Only Nuniz says that one. Plz sir I am history student that’s y posted this one. ek to mushkill se 12 – 15 question puchne ke is topic me or itna sara padhne ka bachhe ki jaan le kar rahega upsc??? 90-95 general. any chance of clearing prelims 16?